Welcome Fall! Whenever we think about the Autumn season, my family immediately thinks about pumpkins. 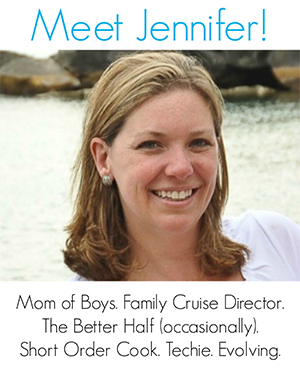 Short ones, fat ones, misshapen ones. You name it! 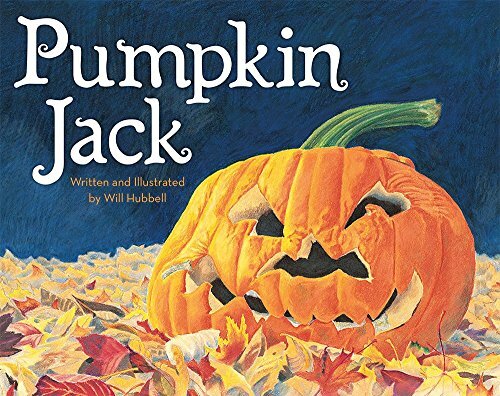 To celebrate the Fall season, here are 10 wonderful children’s picture books about pumpkins your own pumpkin is sure to adore. A serious long-time favorite of ours has been Five Little Pumpkins. I’ve read that one so much I actually have the poem memorized. And a new one to check out that my boys just adored when I brought it home is Little Boo. From Seed to Pumpkin (Let’s-Read-and-Find-Out Science 1): In the fall, pumpkins are everywhere: in the garden, in the supermarkets, and on doorsteps. But do you know how they grow from a tiny yellow seed to a pumpkin? 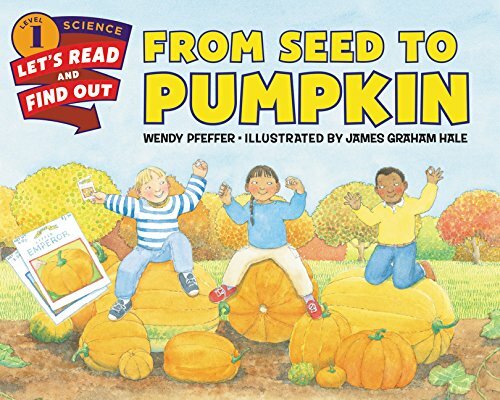 In this classic Level 1 Let’s-Read-and-Find-Out picture book, Wendy Pfeffer’s lively text combines with James Graham Hale’s beautiful watercolors to bring readers into the pumpkin patch to show them how little seeds transform into big pumpkins. How Many Seeds in a Pumpkin? 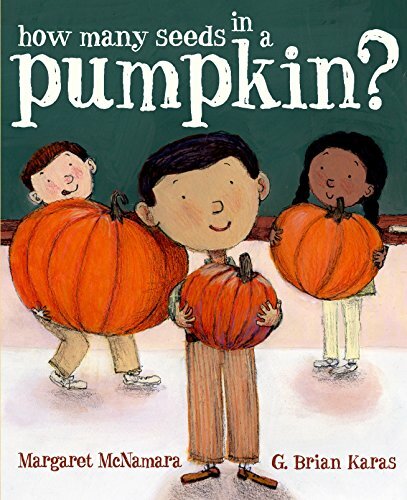 (Mr. Tiffin’s Classroom Series): Here is an adorable picture book for curious kids, which explores skip counting and estimation in a fun pumpkin-themed classroom experiment. This book makes a wonderful read-aloud companion to any math or science curriculum, and it’s a fun way to reinforce counting skills at home. 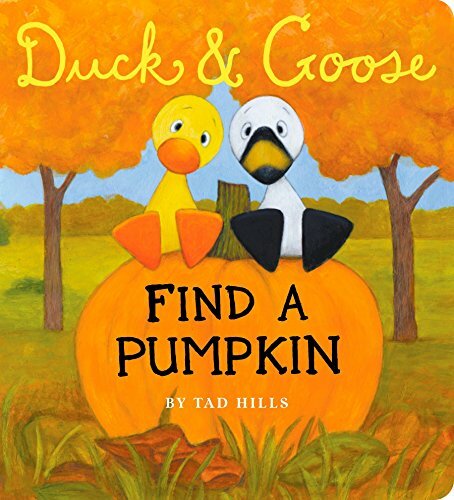 Duck & Goose, Find a Pumpkin (Oversized Board Book): New York Times bestselling author and illustrator Tad Hills brings our favorite feathered friends out to find a big, beautiful pumpkin in this sturdy, large-sized board book. Duck & Goose look everywhere for a pumpkin—in the apple tree, in the leaf pile, inside a hollow log…. Where will they find one? 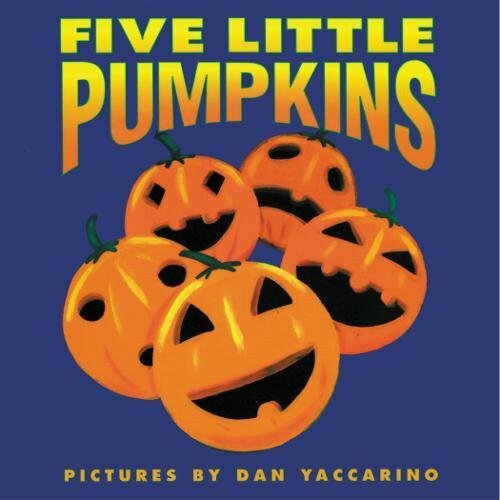 With bouncy, rhyming text in verse from the classic nursery rhyme and bold, dynamic illustrations from acclaimed author-illustrator Dan Yaccarino, Five Little Pumpkins is a must-have Halloween board book! Roll along with the pumpkins and their spooky friends as they get into some spirited Halloween fun. The perfect gift for little pumpkins everywhere. Pumpkin Jack: The first pumpkin Tim ever carved was fierce and funny, and he named it Jack. When Halloween was over and the pumpkin was beginning to rot, Tim set it out in the garden and throughout the weeks he watched it change. 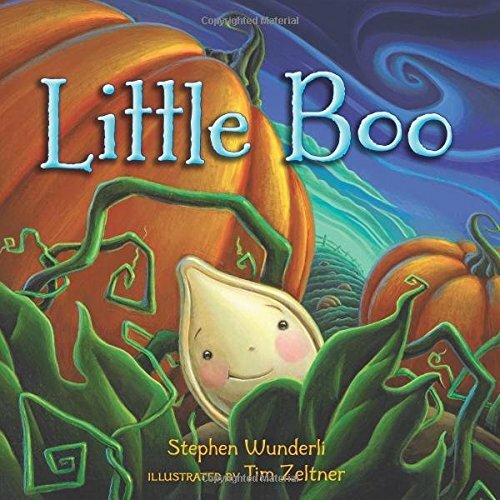 Little Boo: The leaves fall, the wind blows, and one little pumpkin seed tries and tries to be scary. But he doesn’t scare anyone . . . not the snowflakes in winter, not the bees in spring, not even the watering can! The wind tells him to be patient―he’ll be scary soon enough. But waiting is hard. Will the little seed ever be really, truly scary? 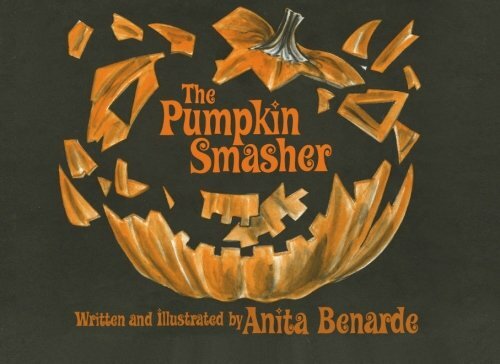 This simple story is more than a fun Halloween read―it is a heartwarming tale perfect for any child who can’t wait to grow up. Scaredy-Cat, Splat! 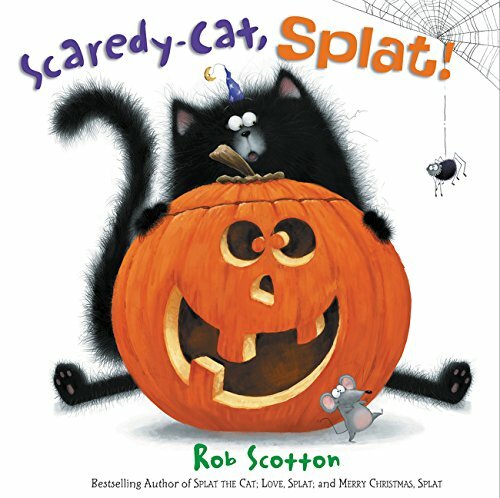 (Splat the Cat): It’s Halloween, and Splat is determined to be the scariest cat in the class. Unfortunately, he’s just too much of a scaredy-cat. He’s afraid of a little spider, and everyone says his costume looks more silly than scary. And when Mrs. Wimpydimple tells a ghost story in the dark, Splat gets so frightened that he tips over his jack-o’-lantern. But when the lights go back on, the entire class is scared silly by a small, black, furry creature with a big pumpkin head. Whooooo can it be? 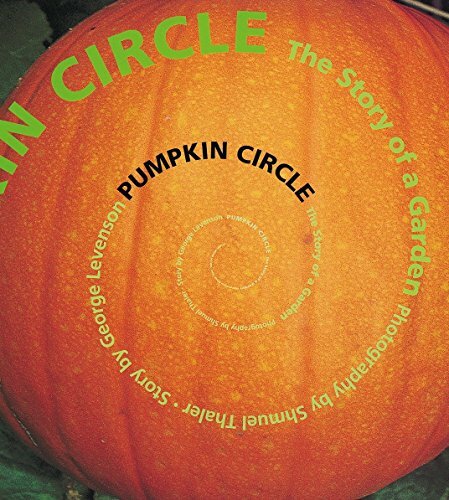 Pumpkin Circle: The Story of a Garden: We can be sure of this: It’s a circle without end. It’s pumpkin seeds to pumpkins To pumpkin seeds again! This treat of a picture book comes cloaked in the colors of fall. Bouncy verse and glowing photographs show a backyard pumpkin patch move through its natural cycle — a bug’s eye and a bird’s high view of seeds sprouting, flowers blooming, bees buzzing, pumpkins growing . . .and then going back to earth. 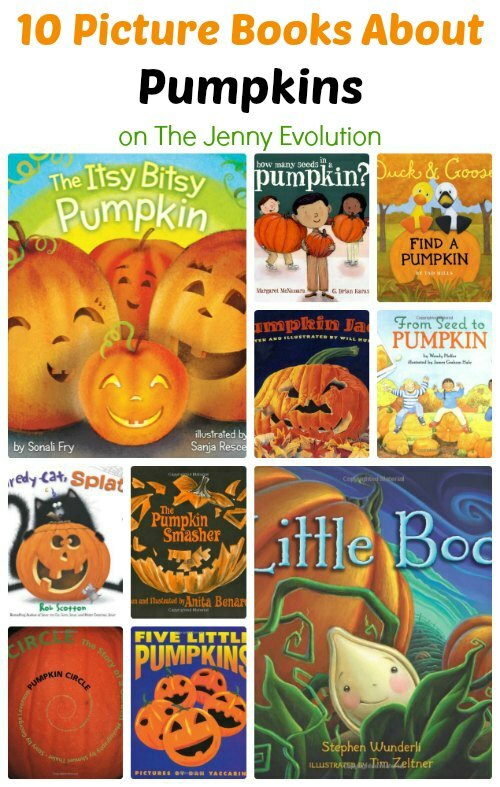 Like these picture books about pumpkins? Find even more engaging book lists for kids with more than 100 book-themed reading lists! We are planning a visit to the farm and my grand kids are so excited to be able to go and pick their own pumpkins. I know they are going to enjoy reading any of these books. Have fun visiting the farm. Picking our own pumpkins is always the highlight for us. I enjoy reading seasonal books to my kids. Some of these are new to me. Terrific. 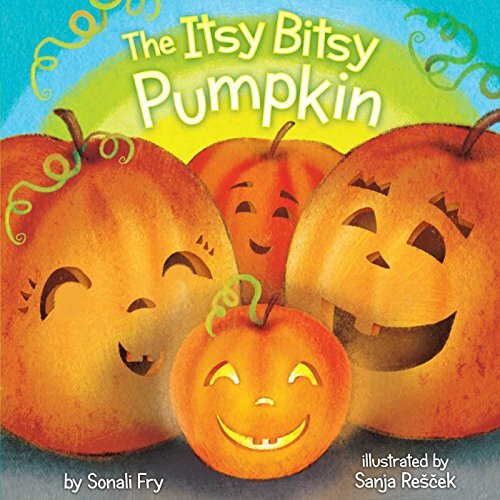 Another great pumpkin book that is tons of fun and educational is THE BIGGEST PUMPKIN by Sandra Horning (published by Pelican Publishing). Kids learn about the gardening/growth cycle for pumpkins in the context of a boy’s growing excitement over taking his giant pumpkin to be weighed in at the local fair.